A multimedia project that started as childhood memories of transiting with my family in the fifties via the camp Le Grand Arénas near Marseilles on our way from Egypt to Israel and continued as an exploration of the concept of “camp” through excavations, drawings, maps, photos, documentary movie and architectural models. Initiated as a series of seven installations at the MAC in Marseilles in 1998, the project was further presented in Italy, Lithuania, and Israel. The Camp of the Jews, the Grand Arénas Transit Camp, Marseilles. The project began when I visited Marseilles in 1998 at the occasion of a group exhibition. The visit reactivated painful memories. I had been in the city in the fifties. My family had been forced to leave Egypt with a travel document (laissez-passer) valid for exit only. On the way to Israel we stayed in Marseilles at the transit camp Le Grand Arénas. Today, only fragments of a stone gate and a white wall bearing a drawn arrow and the words “To the hospital.” The site is now a bare, rocky ground, a no-man’s land in an immigrant quarter housing the offspring of the camp’s original inhabitants. Le Grand Arénas was built in the immediate aftermath of the Second World War, when the municipal authorities of Marseilles faced the urgent task of accommodating political prisoners, demobilized soldiers from the Soviet Union, migrant workers from the colonies (Algeria and Indochina), Holocaust survivors and refugees. They allocated a lot in the city’s south for that purpose. It was far from the center, near the central prison Les Baumettes, in the empty area around the village of La Cayolle. The task was entrusted to French architect Fernand Pouillon who found efficient solutions using the meager resources at his disposal—clay and a very small amount of concrete—so that it was precisely the shortages that made him dare, improvise and invent. With building materials and skilled workers in short supply, Pouillon managed to complete the assignment by using a method developed during the Occupation by architect Jacques Couëlle, the “fusée-céramique” (ceramic rocket). These were ceramic bottles whose bottom parts were truncated, “bottled” to one another, link by link, to create an arch (parabola). The fusée-céramique had been manufactured during the war in a shingle factory that signed a contract to supply three million bottles to the TODT company in Germany, where they were used to renovate ruined bridges and subterranean bomb shelters. At the end of the war the bottles were confiscated and kept in American army warehouses. Pouillon used the fusée-céramique to build the structure of the semi-barrel barracks where refugees lived. Post-war Marseilles became a center of activity for Jewish institutions in France. Jews from Displaced Persons camps and from North Africa, immigrants in transit (initially illegally, and later, upon the establishment of the State of Israel, organised by official institutions) were gathered in Le Grand Arénas, which became known as “the Camp of the Jews.” In the fifties, as a result of the shortage of housing for poor families, some buildings of the camps were occupied by squatters (families on a waiting list for social housing, families evicted from housing considered dangerous by the city authorities). In 1953, the Ministry of Reconstruction and Housing ordered the building of a relocation town next to the camp, the Nouvel Arénas (New Arénas). This consisted of prefabricated, rectangular, single storey buildings divided into four flats. Within one year, the living conditions and degradation of the Nouvel Arénas were denounced. In 1966, the Jewish Agency announced that its mission in Marseilles was complete. At the same time, the Marseilles municipality issued a decree stating that the prefab structures could not be used any longer for the housing of migrants and soon afterwards ordered the destruction of these temporary structures. The Grand Arénas disappeared and left a deserted place in ruin. I remember that life at the camp was hard, and for decades I had repressed my memory of it. However, once I arrived in Marseilles, things came back to me. I told Curator of Cultural Heritage Christine Breton, who hosted me in her home, about this experience. She put me in touch with Nathalie Deguigné who had written a thesis about the “Camp of the Jews.” We went together to the site. I returned several times during my stay in Marseilles. Seeing me searching, some youngsters asked whether I was looking for the “camp of the Jews” and asked to join me. Together we found the remains of one of the barracks—parts of walls with fragments of ceramic bottles embedded in them. What had started as a journey into my memory soon turned into a work-in-progress analyzing the concept of “camp” through conversations with Nathalie Deguigné and historian Emile Témime (co-authors of Le camp du Grand Arénas, Marseille, 1944-1966), new research materials, excavations conducted in collaboration with the inhabitants of La Cayolle, and interviews of people who too had transited via Le Grand Arénas. These interviews formed the basis of my documentary movie The Camp of the Jews. On the invitation of the MAC (Musée d’Art Contemporain) de Marseilles, in October 1998 I organized a “memory laboratory” inside a shipping container “bottled” by means of ceramic rockets. This is where the initial project, Elémentaire-Elémenterre, was presented. It took the form of seven successive installations representing different stages of digging into the layers of the camp. For the first installation Exodus, Transition, Temporariness (November 27, 1998-January 20, 1999), I created inside the laboratory a new space representing the camp through audiovisual elements. The window of the container was sealed. In the second installation, The Grand Arénas as Architecture of Emergency (January 20-24, 1999), I created linkages between different kinds of architectures of emergency and temporariness through documentary photos and texts. For the third installation, The Ceramic Rocket as a Body (January 24-March 13, 1999), the window was opened onto a model articulated with the laboratory. The new structure was a vault built according to the human body scale, using bottles made after sketches based on the fragments found in excavations. The fourth installation Passing Red Earth, Marseilles-Haifa (March 13-April 10, 1999) connection between France and Israel through both an article about the camp published in the Israeli daily newspaper Davar on August 29, 1950, and the use of a bottle and maritime maps of the Mediterranean Sea. The fifth installation Archaeological Excavations in the Territory of the Camp (April 10-20, 1999) presented the findings of the excavations I had conducted with offspring of immigrants, unearthing the foundations of one of the barracks. 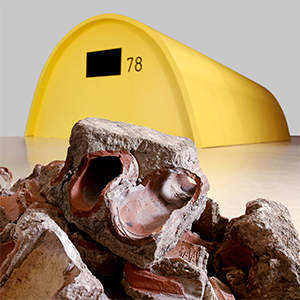 The sixth installation The Ceramic-Rockets as Symbol of Reconstruction (April 20-May 10, 1999) displayed truncated sections of walls and fragments of ceramic bottles placed on a conveyor belt. The last installation Kri’ah: Closing the Laboratory (May 20-27, 1999) was based on the completion of a circle. I incised the form of an arch the size of the bottled barracks model in the container wall. I filled the gaps with polyethurane foam, which swelled gradually during the days of the installation, covering the cut borders. It congealed and coagulated, leaving a turbid yellow-gray scare, a literal interpretation of trauma. Over the years, my exploration of the notion of “camp” developed a bit aside of the original history of Le Grand Arénas, and focused on the formation of community in the specific environment of refugee camp, and the long-lasting effect on societies in which parts of the population have experienced life in camps (Israel and Palestine). New phases of the project were presented in different locations. The installation Transmission (installation), including a new version of the ceramic-rocket in blue glass manufactured in Hebron, was shown at the Cittadellarte/Pistoletto Foundation in Biella, Italy in 1999. With the exhibition Camp of the Jews: On Uprooted-ness, Refugee-ism and Immigration, at Herzliya Museum of Contemporary Art in 2005, I intended to initiate a debate on migration issues in Israel and about the notion of Camp as a site of Israeli culture. The museum is a special place, a combination of museum and memorial for fallen soldiers, built from concrete. Inside the museum, I constructed one of the semi-barrel barracks of Le Grand Arénas out of formica. The idea was not to reproduce the original structure but to create an experiential construction that employed contemporary materials. I did not screen my documentary movie The Camp of the Jews but a film made for the Jewish Agency in 1963 as propaganda for Jewish migrants from North African countries. The subtitles were projected onto a separate background. This was a way for me to bring an Israeli audience to reflect on its own history of migration in relation to the military reminiscence implied by the venue itself; how these two forms of occupation of territory interact in building this peculiar situation, Israel, the camp-country. Through such reflection, I wanted to invite Israelis to compare Jewish refugee-ism and uprooted-ness that had played such an important role in their own society with the refugee-ism and uprooted-ness of the Palestinians. "Mémoires d'un architecte." Fernand Pouillon; Paris, Éditions du Seuil, 1968. Auto-biography of the architect that decided to use in 1945 the remarkable construction method of the housing of the refugee camp based in the 're-invention' of the ancinet method of “fusée-céramique” by Jacques Couëlle. An illustrated summary of the book of Pouillon in PDF format.